It's been around a month now since Robert Collins reported the arrival of four National Express Caetano Levante bodied Volvo B9R coaches at Ambassador Travel's Gapton Hall premises in James Watt Close. The multi coloured world of First Norwich found its way on to the Great Yarmouth 8 service this morning with Orange Line liveried 33169 LR02LYJ noted in use on my way to work this morning. Norwich vehicles come down to Great Yarmouth for MOT so i expect it has been at Caister Road for work and drafted into use this morning. It is pictured on 28th January 1995 laying over at Gasworks Road in Lowestoft next to the then Eastern Counties depot. Numbered 397 in the fleet, it had just arrived on the 12:00 service 74 from Cambridge. 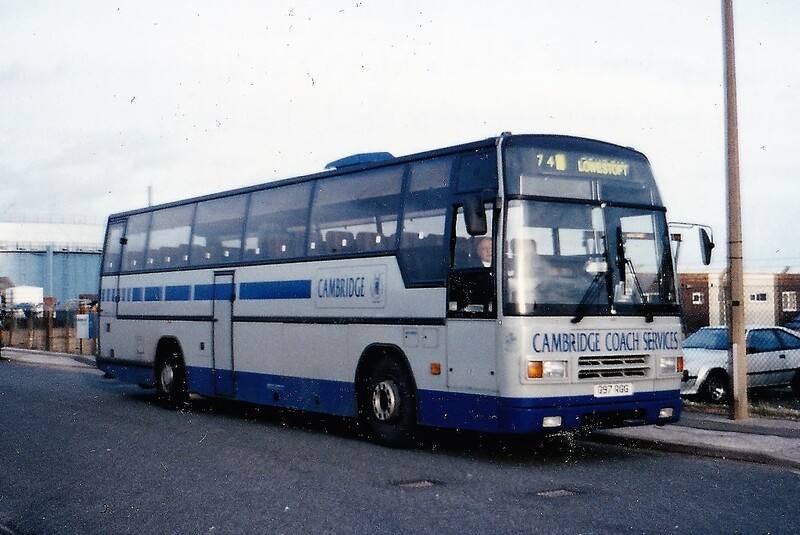 G97RGG was delivered new to Park of Hamilton in March 1990 but was owned by Cambridge Coach Services from October 1991 to December 1998. By December of the following year it was reported with Dawson of Newcastle seeing regular use in the Stoke on Trent area. It was subsequently owned by Spearings of Welland and Kingfisher of Blackwood. In 2014 it was noted as being for sale on eBay. Yesterday evening saw another two former First Borders vehicles arrive in Norfolk, this time in the shape of Volvo B9TL's 37141 SN57HDA & 37142 SN57HDC. Both arrived around 8.30pm after the long drive down from Scotland. Many Thanks once again to Simon Taylor for the photographs. A busy day of news coming out of Caister Road this evening, Firstly the arrival of two Alexander Dennis Enviro 300's from First Borders in the shape of 67763 SN62AUK & 67773 SN62AXH. 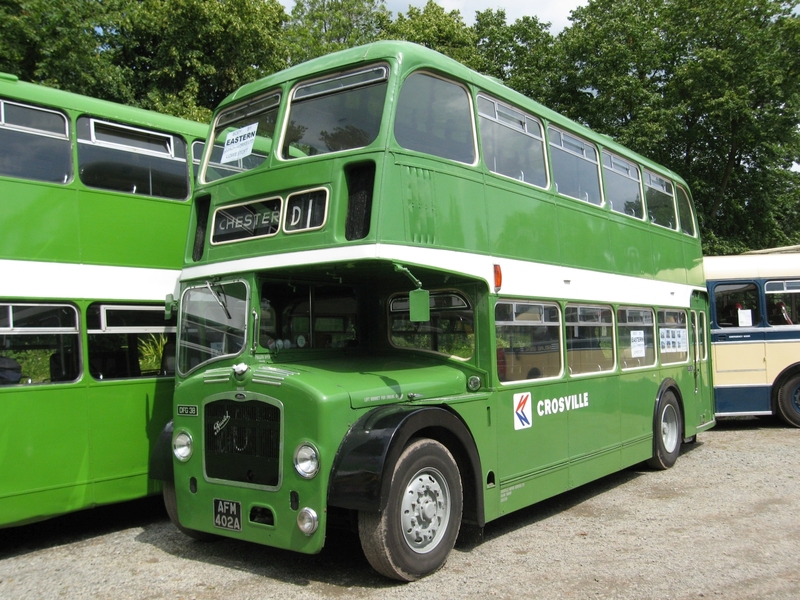 Both have come from the recently sold Galashies Depot, where operations have been taken over by Borders Buses. 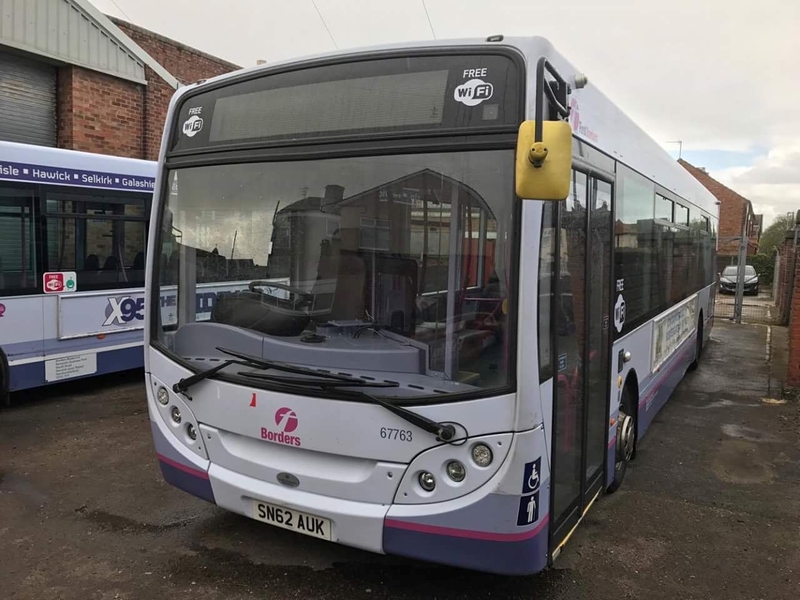 A batch of 9 are expected for use in Ipswich for the new Park & Ride service which begins in July, all arrivals will be prepared for service at Caister Road before heading to Suffolk and may appear in use in the town prior to moving on. In other news, Yarmouth is losing two ex Leeds Volvo B9's to Norwich for use on the new Charcoal Line, 36181 BF12KXU is currently at Simon Morris in Ipswich being repainted with 36182 BX12KXV expected to follow. 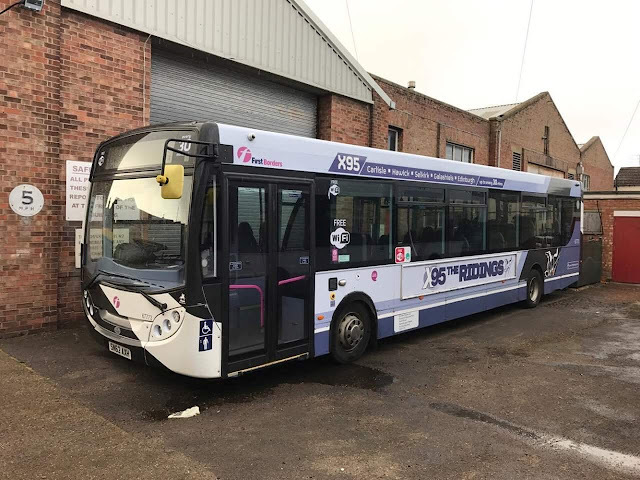 Two replacements for these are expected to arrive shortly also from First Borders in the shape of Volvo B9's 37141 SN57HDA & 37142 SN57HDC, Im told both are heading for Norfolk this evening. Thanks to First for all the info and to Simon Taylor for the Photographs which were taken with permission. Today's Notice and Proceedings Report, published by the East of England Traffic Commissioner, publishes the following changes to bus services in our local area. 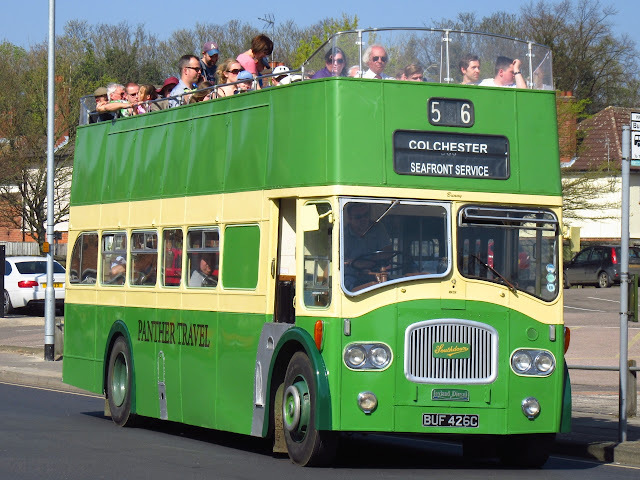 Ipswich Buses is to vary the timetable of its Felixstowe Open Top Tour from 26th July 2017. Under short notice, Borderbus is to retrospectively vary the timetable of its 580 route between Bungay and Great Yarmouth, via Beccles, from 18th April 2017. Konectbus has received approval for a new operating centre for 25 vehicles at Anglian Bus & Coach Limited at Ellough in Beccles. From the beginning of the timetable change, service 1B will run at hourly intervals between Vauxhall Holiday Park and Hemsby Beach via Market Gates seven days a week. It will also provide a link to the railway station. From mid July the frequency will increase to every thirty minutes Mondays to Saturdays. Together with services 1/1A, Hemsby will have a bus every fifteen minutes into Great Yarmouth Town Centre on those daysOn Sundays, a through service will be introduced between Lowestoft and Martham on Service 1/1A, operating hourly during the day. There will be also a new journey from Tessera Park to Market Gates bus station at 0930 on weekdays. Early morning and afternoon journeys that serve Flegg High School and East Norfolk Sixth Form College will see minor timetable adjustments to improve punctuality. 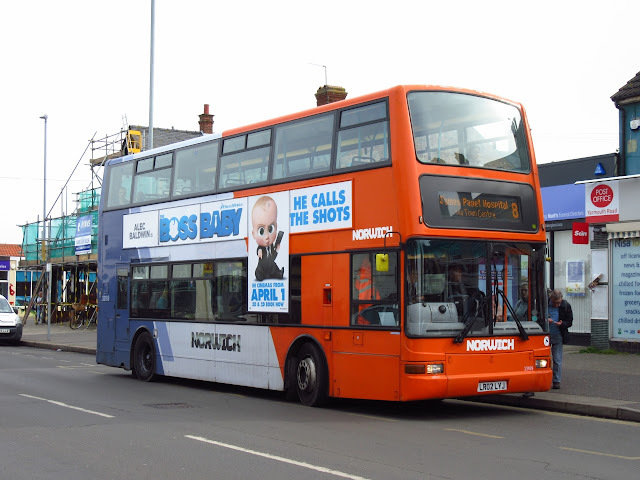 In partnership with Norfolk County Council, service 2 will be increased to every 20 minutes on Sundays, providing a fast and direct link from Barrack Estate to Great Yarmouth town centre, also serving the Pleasure Beach. The open-top service 3 returns with a new route between Haven Seashore Park and Pleasure Beach every thirty minutes, seven days a week. 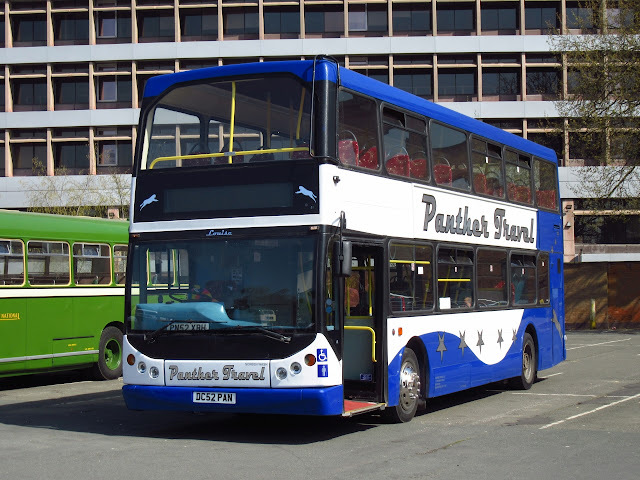 The service will travel along the entirety of The Golden Mile, serving Britannia Pier, the Marina Leisure Centre, the Sealife Centre and the Pleasure Beach, Additionally on Wednesday evenings it will run later in connection with the summer firework displays. Following passenger feedback, service 4 is to be re-timed to depart at 28 minutes past the hour from Market Gates. There are no changes to frequency or route. Sunday daytime services will be replaced by service X11, extending to Acle and Norwich via James Paget Hospital. There are no changes to early morning and evening journeys. There are minor changes to early morning services. An hourly Sunday daytime service will be introduced on Service X11, which will provide Belton with a direct service to Norwich seven days a week. 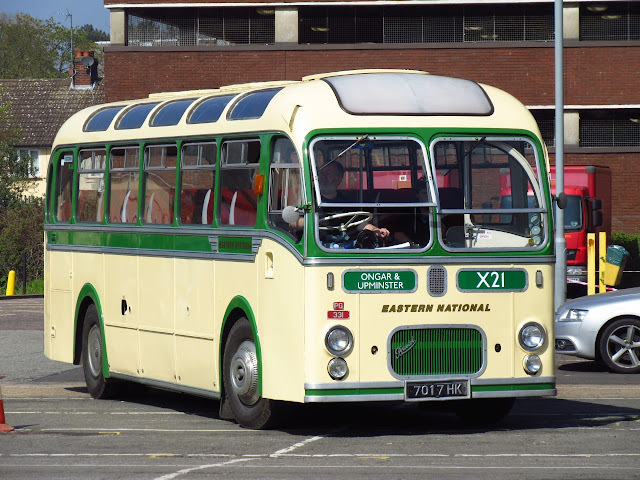 There will be minor changes to the X1 timetable between Lowestoft and Norwich and, combined with the X11, there will still be a thirty minute frequency between Gorleston High Street, Market Gates and Norwich on Sundays. Weekday journeys starting from Belton on the X11 will be re-timed slightly to improve punctuality. There will be some very minor changes to morning peak journeys from Great Yarmouth. Afternoon journeys from Norwich will be revised in order to provide extra buses and capacity to Great Yarmouth at the start of the rush hour. 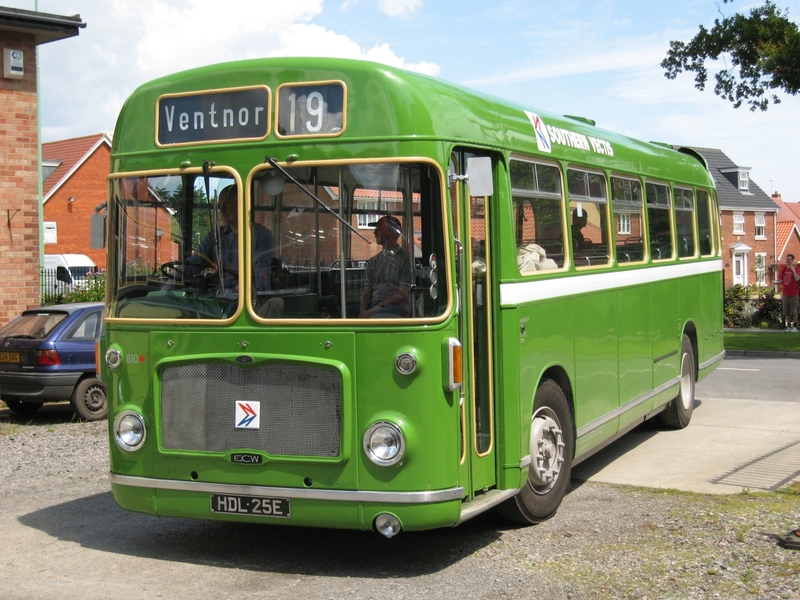 The Mid Norfolk Railway's Vintage Bus & Coach Day took place on Sunday last although I didn't go! However, regular contributor Tim Major did attend and he believes 25 to 30 interesting vehicles took part. Included in the event were trips out to Yaxham, County School and Hardingham - the latter being timed to link with the MNR train service. My thanks to Tim for the photos. Early yesterday evening I wandered past Beach Coach Station and found it comparatively empty as the contractor vehicles for the weekend's fair had moved to the market place to deconstruct the rides there. Surprisingly there were five coaches present including two of them from Lancashire operator Alfa Travel. They were both Mercedes Benz Tourismos with the registrations BN11UFL and BX14OMO. Incidentally the company has recently taken delivery of seven new Tourismos and it is hoped they will start appearing here fairly soon. Sandwiched between the two was Bova Futura SIL4469 from Lovden Travel of Lincolnshire. It was delivered new to Fen Travel of March in Cambridgeshire as T4FEN in March 1999. The remaining coaches were National Holidays' Setra NH10JSH and Swindon based Barnes Coaches' Van Hool TX16 Alicron YJ12CGG. My friend and I were on a tour round Norfolk and parts of Suffolk yesterday and called in at the Hollies camping site at Kessingland. They kindly allowed us to photograph the ex-Hedingham deckers they have acquired. We also called at Border Bus where we photographed the school run out. A bonus here was the arrival of ex-Great Yarmouth EX 6566 which almost took us by surprise as it turned into the Moor Lane Business Park. We thought it might have been going to the Border Bus premises but could find no trace of it there so assume it must be stored at one of the other units on the industrial estate. Later in the afternoon we tracked down a real survivor in 1983 Bedford A400 NNK now owned by new operator Jubilee Coaches of Rollesby. 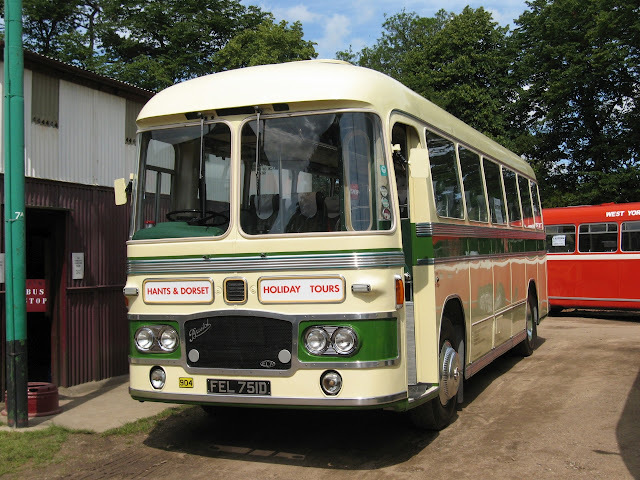 They have acquired no fewer than three Bedfords which were in the fleet of Turner and Butcher of Kenninghall and then subsequently passed to Norfolk Coachways of Attleborough after Turner and Butcher ceased operating. A400 NNK was new to a London operator then passed to Harrods of Wormegay who only had it for a few months before it was involved in a very bad crash at Necton on the A47. Looking like a write-off it was repaired and then worked for Spratts of Wreningham before moving on to Turner and Butcher. My thanks to David Bell for his report and the last two photos - which retain his copyright. This week's Throw Back Thursday means a trip back to Lowestoft's Gasworks Road depot on the 28th February 1995. 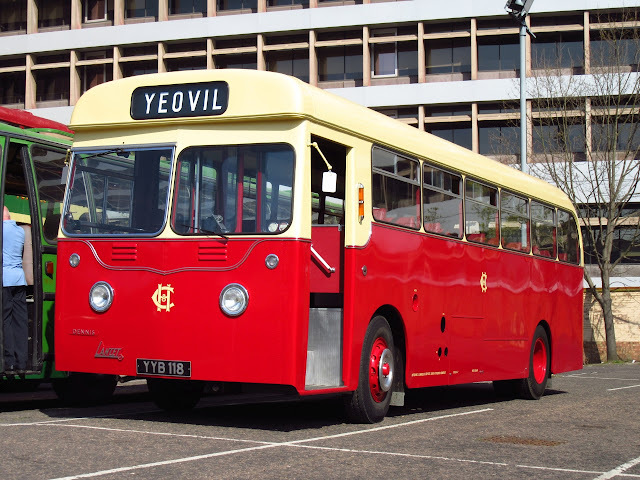 Outside is a freshly painted Eastern Coach Works bodied Bristol VR in the form of JNG54N. 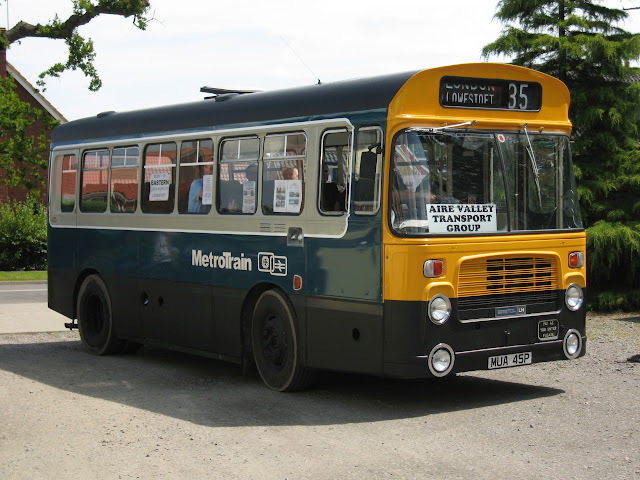 New to Eastern Counties in May 1975, it received fleet number VR156. Other than a photo on Flickr of VR156 leaving Market Gates on a wet April day in 1994, there's no further information about it on the internet. However, the decker was subsequently sold to dealer Ben Jordan of Coltishall for scrap during May 1997. A few entries affecting local services are included in this week's Notices and Proceedings Report. 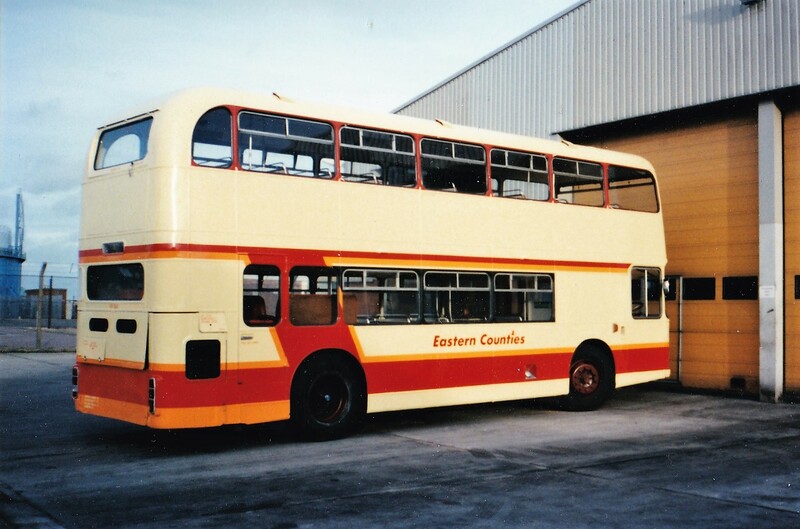 First Eastern Counties is to amend the timetable of its X2/X22 Lowestoft Bus Station to Norwich . route from 28th May 2017. The operator has also retrospectively applied to change the timetable of its 912/913 Rackheath to Hoveton's Broadland High School service commencing on 12th April 2017. National Express is cancelling its 727 service between Gatwick Airport and Norwich Bus Station from 5th June 2017. As you will have seen from the recent Anglian Alternatives post, Our Bus has begun a weekday morning outward and return 271 service to Bradwell. Commencing yesterday, it is an extension to its own Hemsby to Great Yarmouth 271 service. Starting at the Green Lane/St Nicholas Gardens stop in Bradwell, the bus travels along Beccles Road to Gorleston High Street and Great Yarmouth via Crab Lane and Church Lane. The return journey is a reverse of the same route. 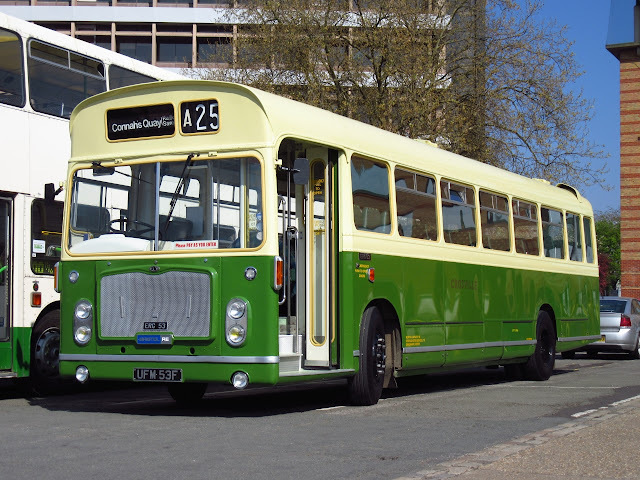 The timetable of the 271 service can be viewed HERE on the Our Bus website. Today sees the introduction of a revised Anglianbus 61 Kessingland to Great Yarmouth service. Between Gorleston and Great Yarmouth the bus travels via Harfrey's Estate and Gapton Hall Road instead of Southtown Road. The new route allows the operator to serve Gapton Hall Retail Park and Tesco Extra at Cobholm. I trust you all haven't overindulged in consuming too many Easter eggs today!! Just a quick post on my sightings at Beach Coach Station earlier this afternoon. There was a 'grand total' of three coaches present which included regulars from the National Holidays and Shearings fleets. The former was represented by Setra NH14FBH whilst similar BK10EJC was from the latter fleet. The third attendee was unusually York Pullman's Plaxton Paragon bodied Volvo B12M J3YPB. Formerly registered as YN06RWL, the coach was new to Logan of Dunloy in May 2006. After the past weekend's event at Ipswich which tied in with the 30th anniversary of the closure of the ECW factory in Lowestoft i thought i would look back ten years (which seems hard to believe!) 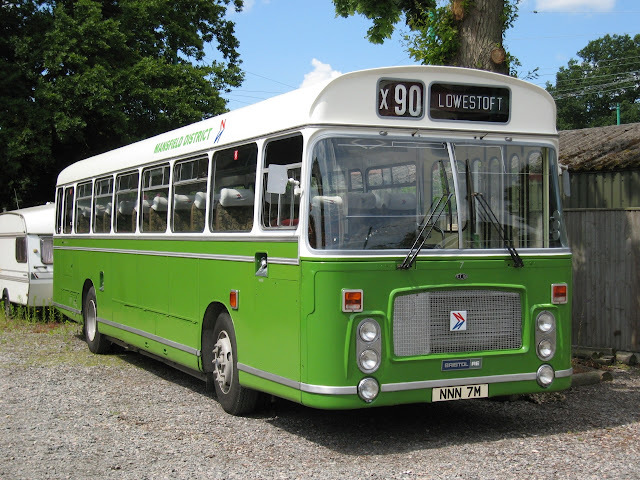 to the event which marked the 20th anniversary which took place at the Eastern Transport Museum in Carlton Colville. Just as Sunday the sun shone and made for a perfect day. Just a selection of some of the fine preserved vehicles on display and used as part of the running day, hard to think it was 10 years ago! 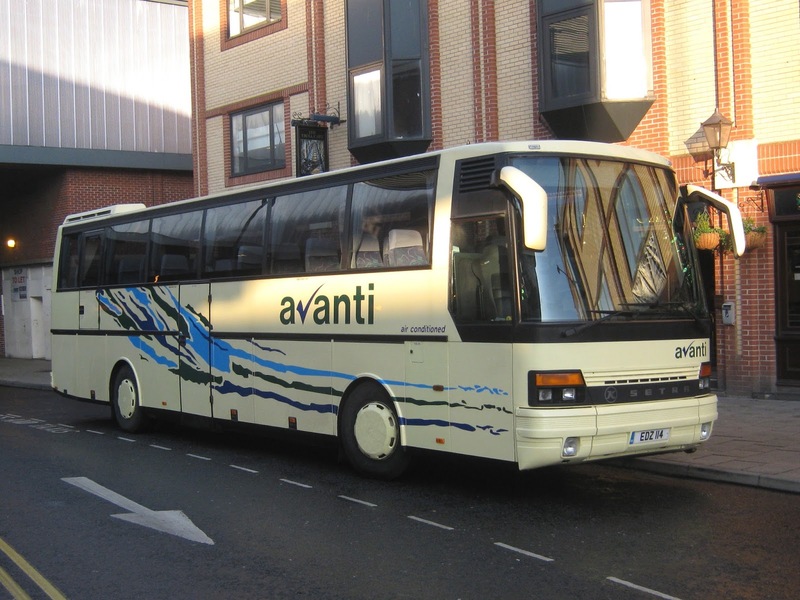 Family run Avanti Coaches is making one of their coaches available for disposal. The Blofield based business, which has its operating centre off Salhouse Road in Norwich, is to sell its Kassbohrer Setra W447WFG according to Route One's Vehicle Directory. Park Royal bodied Daimler Fleetline JGF326K was new to London Transport in February 1972 as their DMS326. It began its career at Aldenham garage with spells at Peckham, Clapham and Battersea before being sold to Ensign in August 1982. 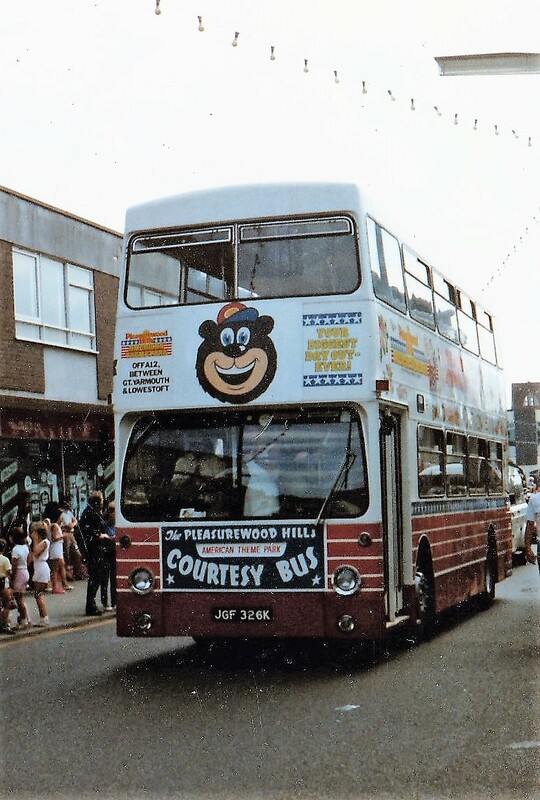 JGF326K was converted to single doorway and subsequently acquired by Pleasurewood Hills in March 1986. 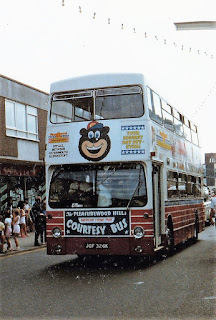 The amusement and theme park operated it on regular courtesy bus services to and from local holiday parks. After an engine failure in early 1994, it was sold to dealers Wigley of Carlton for scrap in March of the following year. This week's Notices & Proceedings Report, published by the East of England Traffic Commissioner, contains details of further forthcoming changes to our local bus services. Our Hire Limited, trading as Our Bus, has registered a new stopping/ hail and ride service between Little Plumstead and Great Yarmouth's Market Gates. The Monday and Wednesday only 74/X74 service commences on 31st May 2017. The operator is also to vary the route, stopping places and timetable of its 730/73A service linking Beighton with Gorleston's East Norfolk Sixth Form College also from 31st May 2017. First Eastern Counties has been given authorisation to amend the number of vehicles operating at its Norwich sites. Lansdowne Road has been removed as an operating centre with Roundtree Way in the city now licensed for 121 vehicles. Incidentally, Vancouver Way in Kings Lynn now has authorisation for 20 vehicles. As Roy has posted a report and a few pictures from yesterday's event, i will share a selection of photographs from the day just to back up the prevoius post, a nice cross section of vehicle types shown in the suffolk sunshine! A gloriously warm sunny day coincided with yesterday's 2017 Ipswich Bus Rally and it was my first visit to the town since May 2010 - how time flies! I am reliably informed that the number of entrants was down on the previous year with Ipswich Buses and First Ipswich being notable absentees. Never the less there were some interesting visitors with some arrivals from our area attending. Overall it was a very enjoyable event. 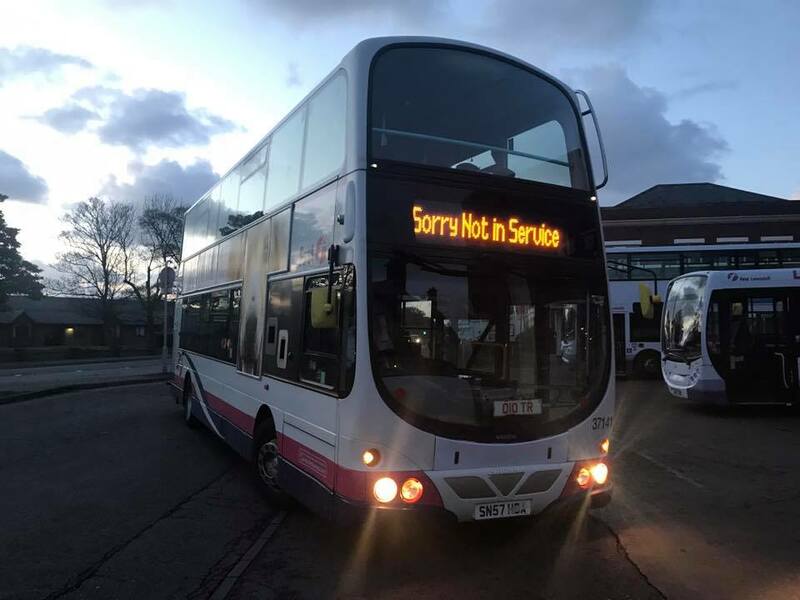 Local entrants were Our Bus Optare Solo MX58AAY and Anglianbus Scania OmniCity YN05HFG which deputised at the last minute for OmniLink AN61BUS which had door issues prior to leaving for the journey south. After further observations I headed back to Portman Road to meet up with fellow bloggers SteveW of Steve's Bus & Train Page, Sam from Norwich Buses Blog, Zak from Norwich Bus Page, Clive from Ipswich Bus Blog and last ,but not least my fellow partner in crime, Grahame Bessey. (oh and I almost forgot the illustrious Tim Miller). A great reunion of like minded persons! Finally, I looked in at Ipswich Station to take in the changes there since my last visit and found this former First Great Yarmouth Volvo B7RLE Wright Eclipse-Urban in use there. 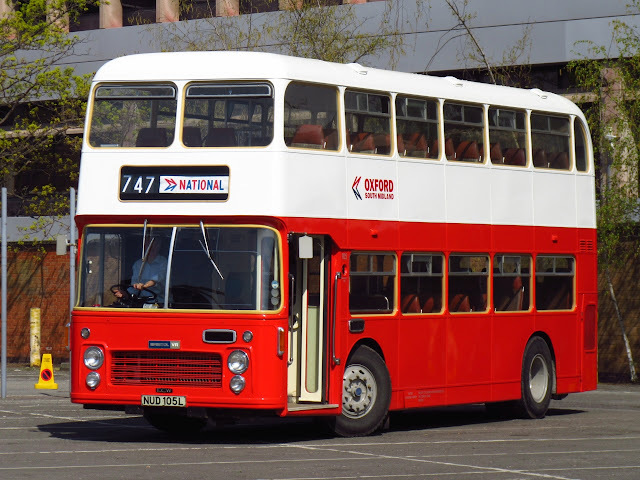 As regular blog readers will know, Anglianbus is withdrawing its 71 Belton to Great Yarmouth and 81 Bungay/Beccles to Great Yarmouth services after this Easter weekend. The 81 service is mainly covered the Borderbus 580 route with its first arrival in Great Yarmouth at 09:15. However, should this be too late for passengers wishing to get into town prior to 9:00 then the Ambassador Travel 879 college day service is being amended to allow connections with Borderbus 146 and First X2 buses from Beccles at Gillingham which will then continue to Market Gates. Also Borderbus is to provide an additional 580 service 17:15 departure from Market Gates. As suggested in this week's Notices & Proceedings Report, Our Bus will be providing a weekday morning outward and return 271 Bradwell service. Commencing at the Green Lane/St Nicholas Gardens stop in the village, the bus will travel along Beccles Road to Gorleston High Street and Great Yarmouth via Crab Lane and Church Lane. The return journey will be the reverse of the same route. 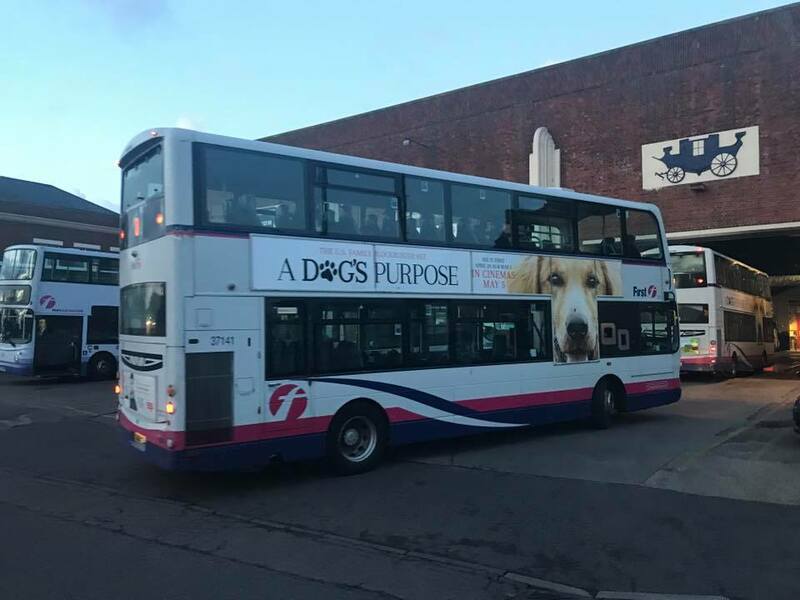 Our Huddersfield correspondent Michael Sayer has been in contact to provide some photos showing that Norwich is not the only part of the First group using the colour coded routes on its buses. Captured on camera the same day is First Halifax's 32526 (YJ54 XUT ) on ZEST branded orange route 503. The bus is pictured at Elland on the Huddersfield to Halifax route. Mike's final contribution is First Huddersfield's 37295 (MX07 BTZ) leaving Holmfirth on the 310 route towards Huddersfield. Anglian Fleet Update ~ To You To Me! More Anglian Buses For The South West?